Well, whether you’re a new or experienced Prepper, this episode is for you. In this episode, we’re going to go over the ten basic items every prepper should have on hand. Actually, as preppers, I imagine most of us would say these are the Top 10 Survival Items EVERYONE should have on hand in the event of a disaster. Now, why are these items important? Well, their important because they are supplies that needed to cover a wide variety of disaster and emergency situations, regardless of what the specific disaster is. 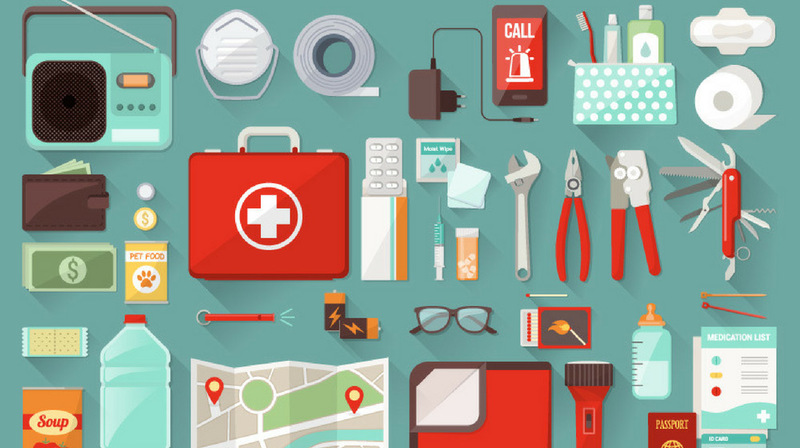 Many of these items are so universal to common sense everyday preparedness, that they’re what I often packed first when deploying to many of the not so nice places that I’ve spent time working around the globe. In this episode, we’re going to go over the top ten items that everyone should keep on hand in the event of a disaster or emergency. If you have these items stored away, then you should be set to weather most everything that is thrown at you. These items establish a solid foundation to begin prepping from. So, whether you are new to prepping, or experienced and want to point other in the right direction, this is a great show for you. Now, before we get going, if you haven’t done so, the contest for a bunch of great preparedness prizes is still going on. So, if you’d like a chance to win a Big Berkey water filter, Prepper Camp tickets, or some other great prizes, go to mind4survival.com/survey and enter. Once you enter, keep an eye out for the email that will take you to the Mind4Survival prepper survey, complete the survey and you’ll be all set to have a chance to win some really awesome prizes. Self-built kits offer the best option to focus your kit on your specific needs. Store-bought kits are often generic and not necessarily designed for your specific situation. Adam Rodis recently had a great post in the Mind4Survival Facebook group showing the first aid kit that he put together, which is a really solid kit. If you aren’t a member, go join the Mind4Survival FB group and check out his post. I think you’ll like it. First Aid Kits / Medical Items can be costly and they expire. Buy various water storage containers and store water on hand. Make sure that you either treat your water or change it out when needed. Do not just store it and forget it. Something to help defend yourself, your family and others if needed. You need as many battery types as you have devices that use different types of batteries. Batteries last 5 to 10 years depending on storage. Batteries aren’t cheap, so look for good batteries on sale, or buy in bulk from discount stores, etc. Alright, everyone, that’s a wrap for episode 52. If you have some additional items that you think should be included in this list, please go to Mind4Survival.com/52 and post your thoughts in the comments section at the bottom of the show notes. Lastly, if you haven’t done so, please be sure to subscribe to this podcast, share it with your friends, and leave me an honest rating on iTunes or whatever podcast app your using. Thanks for Listening to This Episode on Top 10 Survival Items!